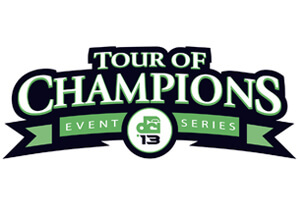 The Tour of Champions series will return to the Drum Corps International Tour in 2013, with an expanded schedule of seven events featuring seven top World Class corps. Debuting in 2011, the Tour of Champions (TOC) brings an exciting nontraditional and experimental event format to the DCI Tour. With special pre-show entertainment and combined corps performances, the TOC series is an engaging and interactive experience for the audience and participating corps members alike. This year's series will feature seven corps including the Blue Devils, Bluecoats, Cadets, Carolina Crown, Cavaliers, Phantom Regiment, and Santa Clara Vanguard. 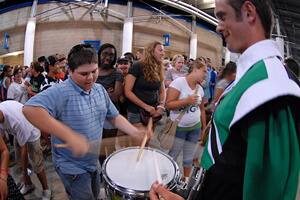 Hallmarks of Tour of Champions events in the past have included the opportunity for fans to interact with corps members as they feature small ensemble performances throughout the stadium prior to the show and during intermissions. 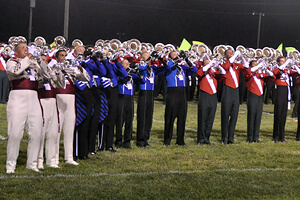 A joint finale featuring all of the corps' brass sections and color guards brings a wall of sound and flourish of color to the end of each TOC experience. Santa Clara Vanguard Executive Director Jeff Fiedler says that the seven corps have a few new additions to keep the 2013 events fresh and exciting, including a cumulative scoring system that will be employed across the series. "The scores for each Tour of Champions event will be based on the DCI judging system, however, we've been discussing a sequential scoring system that will result in a season-long champion at the end of the series," Fiedler said. drummer during a 2011 Tour of Champions event. While he says that the TOC corps are still working on the details, they're looking toward NASCAR and other series sporting events for ideas. Fiedler added: "For this year we've also been talking about new music for the grand finale and again mixing things up competitively with a different performance order for each show. We've been discussing how to work in more spontaneous encores by various corps and streamlining the downtime between performances." Drum corps fans will be able to check out this year's Tour of Champions in a number of new and familiar venues. The seven-event series will kick off in the middle of July and wrap up in August. New stops on this year's schedule include Central Missouri, Austin, Northern Illinois and Eastern New York at Ralph Wilson Stadium, the familiar site of the 1990, 1995 and 2001 DCI World Championships. The grand finale of a 2012 TOC event in Rockford, Ill.
Sunday, July 14 – DeKalb, IL Tour of Champions – Northern Illinois Huskie Stadium at Northern Illinois University Sunday, July 21 – Round Rock, TX Tour of Champions – Austin Round Rock ISD Stadium Friday, July 26 – Murfreesboro, TN Tour of Champions – The Masters of the Summer Music Games Floyd Stadium at Middle Tennessee State University Saturday, July 27 – Charlotte, NC Tour of Champions – NightBEAT American Legion Memorial Stadium Sunday, Aug. 4 – New Jersey Tour of Champions – New Jersey Stadium TBA Monday, Aug. 5 – Buffalo, NY Tour of Champions – Drums Along the Waterfront Ralph Wilson Stadium Tickets to several of these events are currently on sale or will go on sale soon.